Governor Sarah Palin has always had a love/hate relationship with the media, but what has her fired up now are reports that she calls inaccurate, and she has actually personally contacted People Magazine, the Associated Press, and the Anchorage Daily News to let them know they are wrong. 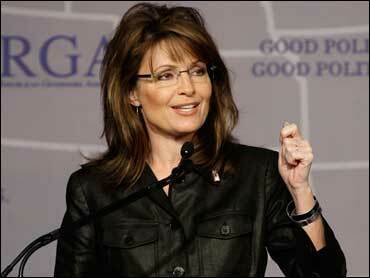 From the moment she burst onto the national stage as John McCain's running mate, Palin has battled the media. "This is all about 'gotcha journalism,'" she told Katie Couric in a Sept. 2008 interview. As Michelle Gielan reports, Palin's most recent gripe with the media is "erroneous information" published about her daughter, Bristol, and her fiance, Levi Johnston, and their education - or lack thereof. According to People.com, Palin left a personal phone message with the magazine denying they were high school dropouts, stating, "You need to know that both Levi and Bristol are working their butts off to parent and going to school and working at the same time. They are certainly not high school dropouts." Media expert and author Michael Levine says it's profoundly unusual, and "in some ways, demeaning of the position she has. It's so clearly an effort to go on offense against a bad situation." Bristol, 18, a high school senior, and Levi Johnston - now working as an electrical apprentice and finishing high school through a correspondence program - had their first child last Saturday. In her first public statement since welcoming her new grandson, Palin sounds enthusiastic, but cautious. "We are over the moon with the arrival of this healthy, beautiful baby. The road ahead for this young couple will not be easy, but nothing worthwhile is ever easy," she said in a press release. Palin goes on to say that she initially looked at the out-of-wedlock, teenage pregnancy with "some fear and a bit of despair," but now considers it an "amazing, joyous blessing." Pictures of that "joyous blessing," Tripp Easton Mitchell Johnston, have yet to surface but you have to imagine it will be a footrace to get the first glimpse.